Did you ever consider buying a cheaper store brand of something, but you weren't sure if it was any good? Now a free app just launched by a Cincinnati startup can help you find out if that house brand item is just as good as the expensive big name. Meg Greenhalgh Pryde is a recent business school grad who wondered why there was no easy way to compare store and name brands. "I was standing in a Walmart, comparing Clorox wipes to the generic version," she said, "and had no idea if the store brand was just as good." She realized that can mean a big price difference in the health and beauty aisle, where a store brand makeup remover or body lotion can be half the price of the big name brand. In addition, Pryde suspected that sometimes both items were the exact same thing, just in different bottles. 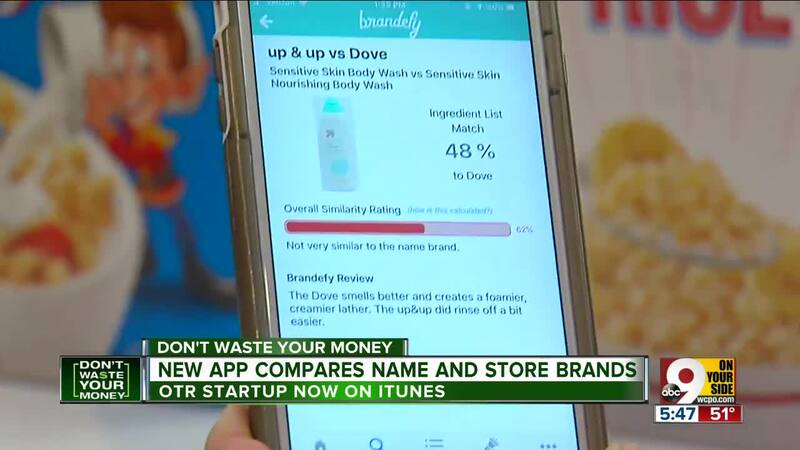 So she decided to launch an app called "Brandefy" to help shoppers compare store brands with the big name brand. "Brandefy compares the generic version of something to the name brand," she explained, "and we tell you whether you should switch to the private label to save money or switch to the name brand because it is truly better." Pryde and her team secured funding from Cincinnati's Brandery incubator and launched the free app on iTunes a few months ago. It's already a hit, with top reviews and 16,000 downloads in just two months. Brandefy has comparisons of more than a thousand food and beauty items. She showed us one example: makeup remover where the cheaper Target brand is rated equally good. "It got a nearly perfect score, so I am going to switch to save money", Pryde said. In some cases though, a name brand, like Dove lotion, rates higher than the generics. "You might want to pay more for the Dove brand because users did not perceive them to be the same," Pryde said. "People in a test group said the Dove smelled better and it was foamier and more lathery." It's all based on real customer tests and reviews, and Brandefy works carefully to avoid online ratings that can be weighted by company shills and fanboys, she said. Brandefy is free on iTunes for iPhone users, though Pryde and her team hope to have it available for Androids sometime soon. It currently focuses on Target and Aldi house brands, but is expanding into Walmart and Kroger as well. So if you have ever wondered if those store brand cheese crackers are as good as Cheez-Its, now you have a way to find out (the real brand rated higher). Pryde says Brandefy could save a shopper several hundred dollars year, so you don't waste your money.